Subtle integrations of emojis into messages help grab audiences’ attention while staying clear and simple. 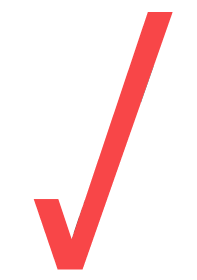 At RedMark, we use an "image-over-words" concept when ideating with new businesses. During the initial brainstorming process, we encourage drawing pictures of ideas. Getting ideas across quickly is vital in this phase, as spending too much time picking apart each idea could kill a blossoming concept too early. And there is no faster way to get ideas across than drawing them. This concept is nothing new; humans have been mixing words and symbols together for hundreds of years from the moment we developed writing. Pictographic languages (languages consisting of images and symbols, such as ancient Egyptian hieroglyphs) have served as effective communication tools to convey messages for generations. But, we don’t have to look that far into history for examples, they are actually so common that we take them for granted. Illuminated exits, road signs and hazard labels can be found all around the world and they all use simple symbols to convey a message. And perhaps the most commonly used example of “image-over-words” today is the always-popular EMOJI! According to CMO.com, 92% of the worlds online population use emojis, sending an astounding 2.3 trillion mobile messages containing emojis each year. That’s a lot of smiley faces. It is safe to say that emojis have snuck their way into the everyday vernacular of the mass market. And as such, marketers should be speaking that language too. Facebook “like rate” statistics prove the efficacy of this concept: Facebook posts with emoticons have a 57% higher like rate, a 33% higher comment rate and a 33% higher share rate. With figures like that it seems that using emojis is a no-brainer! The positive effects of using emojis, however, only work if you use relevant and understandable emojis in your messages. No one wants to see a million hearts and smiley faces every single Facebook post! Subtlety is key. We are particularly in love with a recent non-profit creative campaign by No Kid Hungry, which used emojis to raise money for its cause. Rather than solicit funds directly, No Kid Hungry released an “EmojiMeals” campaign on Instagram Stories. 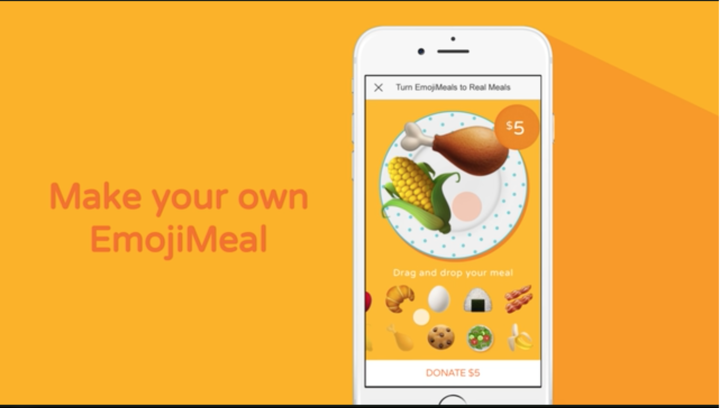 Viewers were prompted to create a meal out of food emojis and then click donate to “turn your emoji meal into a real meal for kids”. Of course, their “emoji meal” could then be proudly displayed on Instagram for all their followers to be encouraged to build a meal to donate as well. What a clever way to make donations tangible and concrete, and engage users around actual donations. Have you seen any awesome emoji-based campaigns out there? We want to know about your faves.